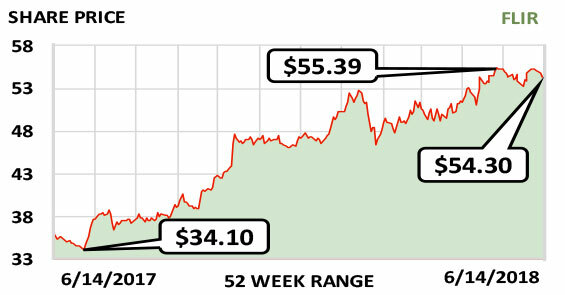 This week’s Stock of the Week is starting to focus on high-margin products that are attractive to a wide variety of industries. Flir Systems Inc. (FLIR), which designs, manufactures and markets thermal and visible-light imaging systems, is shifting its focus. Both CEO James J. Cannon and CFO Carol P. Lowe joined the firm in 2017, and they are de-emphasizing lower-priced, lower-margin products aimed at consumer markets—a business that has not worked well for the company—and repositioning Flir back toward its core, bigger-ticket items. Flir’s business supplying products for military, law-enforcement, public-safety, government and commercial use is strong. As part of the tighter focus, Flir last year sold off a noncore business with $120 million annual revenue, making its revenue from continuing operations seem flatter than it is. Total revenue was $1.8 billion last year and likely will be $1.81 billion this year and $1.91 billion in 2019. Flir competes with some much larger firms, including Lockheed Martin, Raytheon and L3 Technologies, but has an advantage. Instead of originating products specifically for military and other government applications, it tends to use the same core components for that market and for the commercial sector, public safety, research, and industrial markets—giving it a price advantage. The dividend of $0.64/share/yr. recently yielded 1.2% and appears secure. Fiscal year: December. Earnings per share: 2019 est./$2.39…2018 est./$2.18…2017/$1.88.